Vassiliea Stylianidou and Chryssa Tsampazi (founding members of Shifty Tongue_performance group) has interrupted their collaboration. 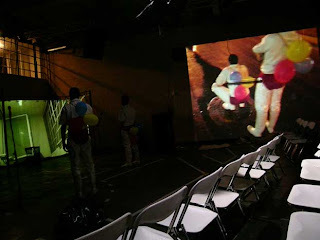 Shifty Tongue_performance group might recommence their collaborations in the future. Chryssa Tsampazi is M.F.A. Candidate at the Performance Dept. at the School of the Art Institute of Chicago. 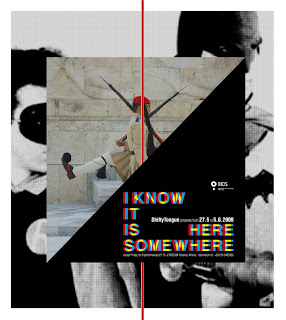 Images from the performance I KNOW IT IS HERE SOMEWHERE, bios athens, may 2008. Performers: Michael Ikonomou and George Papageorgiou. Who are you with Mr. Visitor? More images from the performance I KNOW IT IS HERE SOMEWHERE. Note about the title of the post: The original quote from the performance is "Who are you with Mr. Kopik?" taken from the novel by D. Belantis "Ulrike after Meinhof´s Death". I choose here the paraphrasis "Who are you with Mr. Visitor?" used by curator Eleni Garoufalia in the catalogue NEOEROTICA published in the scope of the "NEOEROTICA Boudoir Street Stories" exhibition in Amfilochia (juli 2008) and Thessaloniki (sept 2008). “What one calls "future" is that which tomorrow, later, next century will be. There is a future which is predictable, programmed, scheduled, foreseeable. But there is a future, l´avenir (to come), which refers to someone who comes, whose arrival is totally unexpected. For me, that is the real future. That which is totally unpredictable. The notion of the “unforeseeable” contains a sense of paradox. With the word “unforeseeable” the language carries into the space of thought the “impenetrable nucleus” of the unknown and offers it a name. That magical word sets the boundaries of whatever knowledge is unable to conquer. The unforeseeable is a linguistic construction. It is that absurdity the performance appropriates. 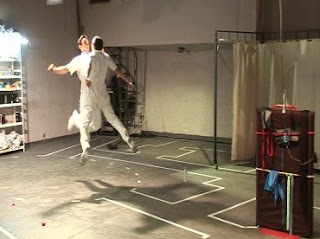 The two performers conspire within a repeated, absurd game. Their goal is to create strictly timed environments in which they are themselves both pawns and players. The unforeseeable is being directed as the personal testimony of third persons. It is the word of others that passes through them and renders them READY AT ALL TIMES. On I KNOW IT IS HERE SOMEWHERE we are doubting the notion of the ‘unforeseeable’ and we pursue an opening to the unknown as the radically Other. We seek positions against the lack of coherence, of understanding and knowledge. 1. A particular unexpected incident which has happened to you or is going to happen. 2. What do you think it has triggered/changed or might trigger or change for you or your life? 3. If you offered it some form, some shape or the features of a man or object which those would be? 4. If you were offered the chance to change it or cause something to it, what would you do? 5. Provide a title for that either real or invented experience. 6. Write whatever more you wish about it. The original concept is developed, among others, also in the space of the blog under the title I KNOW IT IS HERE SOMEWHERE. The contributors are ShiftyTongue, Kostas Sachpazis, Katerina Iliopoulou, Michalis Ikonomou, Vassia Christou and Giorgos Papageorgiou. 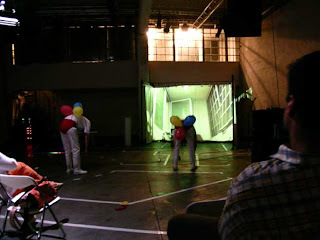 In each performance a viewer will be offered the possibility to intervene on certain points so that he/she becomes an unforeseeable element of the performance. 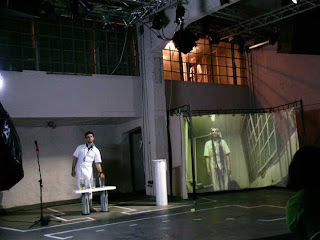 Karaoke Poetry Bar is a multimodal installation which combines poetry, performance and video. The project involves several visual artists and poets and is based on the idea of reversal, i.e. of changing the function of a “space”, transforming it into a generator of possibilities, a playground of ideas. Participant artists and visitors are thus involved in the contingence of utopia.Karaoke Poetry Bar is a real although temporary karaoke bar where pop songs on the stage monitor have been replaced by poems written by Greek poets who have emerged within the last 10 years. During recitation, the poems await to be challenged by the audacity and the intentions of the audience. 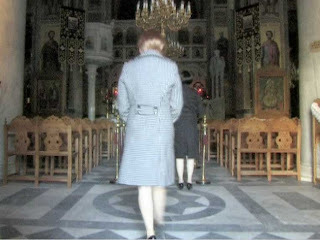 Within the same space, video works by contemporary Greek artists will be presented in a video installation. The video works are documentations of performances in public spaces around Athens, where the artists explore ways of rendering/reciting poetry by established Greek poets of the 20th century. was founded in 2007 in Berlin by Vassiliea Stylianidou and Chryssa Tsampazi. The group lives and works between Berlin, Chicago and Athens. 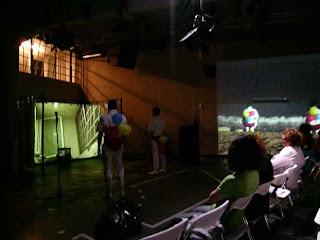 2008 I KNOW IT IS HERE SOMEWHERE, 1. performance at bios centre for today´s art and cross media, Athens. 2008 Athensville, Parallel Plan, Art-Athina 2008. Curated by Marina Fokidis and intothepill.net. 2008 Festival Miden, Video Art Festival Kalamata, GR. 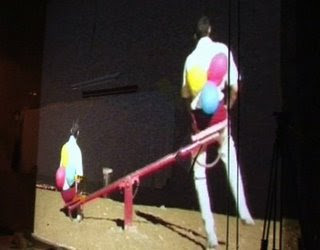 2007 Karaoke poetry bar, a project by intothepill.net in the scope of the 1. Athens Biennial "Destroy Athens", Athens. We observe reality and deal with it as parathesis/juxtaposition, as overlapping and interaction of multiple different ‘Texts’. We call “Text” any visual, acoustic, linguistic -real or invented- element which we detach from reality which surrounds us. 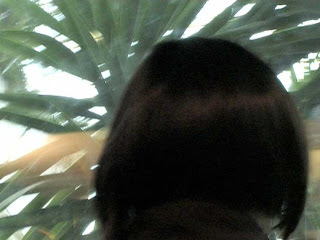 Those elements may be images from every day life, sounds, literary or theoretical texts, a conversation we heard accidentally, a walk, an incident, a dream, a cinematic film. We develop a daily method of collection and it is from such material that the "starting space" of the performance emerges.